Amateur traveler reviews are often instrumental in trip planning. Actual experiences and undoctored photos have proven much more reliable than short descriptions in guidebooks or glamorous hotel websites. Accordingly, we wanted to share our own impressions of our hotel choices during our recent trip to Portugal and Spain for the benefit of other travelers. Our reviews start in Lisbon, where strong TripAdvisor.com reviews led us to Orange 3 House for our 3 night stay. Orange 3 House is a 3-room bed & breakfast located in the heart of Lisbon. The B&B’s proprietor, Igor, is extremely enthusiastic about the city of Lisbon and very dedicated to perfect the experience of his guests. His recommendation led us to Guarda-Mor for fado, which I just incidently described as my “best memory of 2012” to a group of friends. Our room on the third floor at Orange 3 House in Lisbon was modernly apportioned with plenty of natural light. Price. €105/night for 2 people (including breakfast) on the 3rd floor (Suite 3). Orange 3 House offers tremendous value, considering its location in one of Lisbon’s most interesting and convenient neighborhoods and modern amenities. You can save €10/night by staying in the rooms on the first and second floors, neither of which have the partial views of the Tejo River available in our room. Prices drop an additional €10/night across the board in low season. Location. 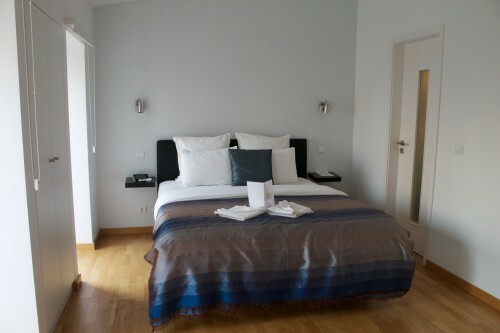 Orange 3 House is located between 2 of Lisbon’s top neighborhoods for cuisine and sightseeing, Chiado and Bairro Alto. It is directly adjacent to the Elevador da Bica (the focus of many Lisbon photographs) and a short walk to both Cais de Sodré and Rossio stations, which offer connections to popular day trip options Belém and Sintra. The only time we ever needed a taxi during our stay was to connect to and from the airport. We can think of no better spot for a Lisbon home base. Room. We stayed in Suite 3, located on the 3rd floor. The room featured a small balcony with partial views of the Tejo River (pictured below). Unlike many other accomodations in Europe, Orange 3 House has floor-to-ceiling windows that allow ample natural light into the room. It also offered a spacious shower (with the overhead rain nozzles that are becoming so popular) and modern conveniences like a flat screen television are free wi-fi. Our room was the perfect place to relax and enjoy a bottle of wine before heading-out for dinner, especially after opening the large windows to enjoy the evening breeze and sounds of the city. 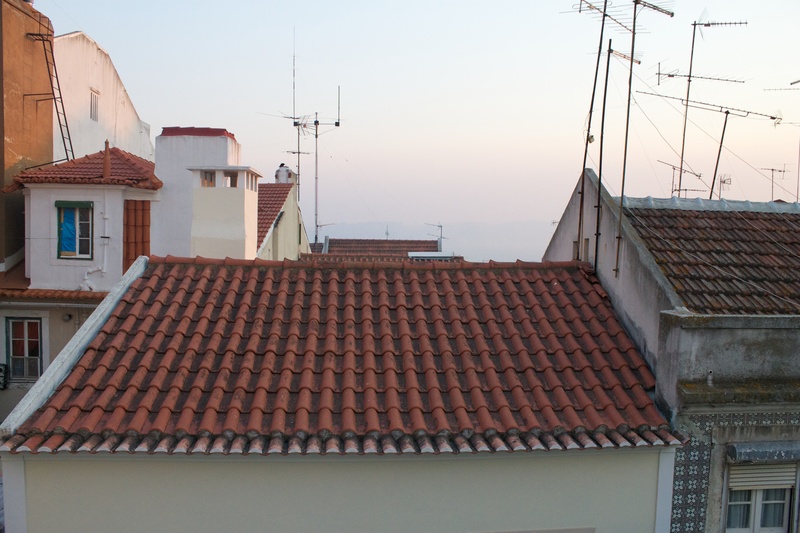 The balcony on Suite 3 at Orange 3 House offers partial views of the Tejo River. Dining. We were given a free bottle of wine at check-in and had access to the downstairs fridge for affordably priced beers, more wine, and snacks at any hour during our stay. The breakfast is continental, but was delicious and provided us plenty of fuel to get through to lunch. Every morning, we were surprised with a new local specialty pastry that was included as part of the breakfast, which was a nice touch. We were also packed a to-go breakfast when we needed to catch an early morning flight our last day, which we certainly hadn’t expected! Amenities. Igor offers his guests free wi-fi, which had a strong signal on both the top floor and in the lobby. I would recommend you go through Orange 3 House to arrange your transportation to and from the airport. We tried to get our own cab on the way there, and they were unfamiliar with the neighborhood (dropping us off at the top of the Elevador, thinking the streets below were pedestrian only) and overcharged us. On the way back, we had Igor arrange our taxi back and he picked us up right outside, and charged us the fair rate. If we are lucky enough to return to Lisbon in the near future, I expect we won’t even to bother researching places to stay, given our complete satisfaction with Orange 3 House. We were amazed by Igor’s superlative hospitality and loved our room and location. This entry was posted in Hotel Review, Travel and tagged hotel, Lisbon, Portugal, Portugal/Spain 2012 Trip by Ryan. Bookmark the permalink.